SOME of our older generation may recall their grandparents talk about the meitheal, which was an old Irish tradition where local farming families within a community would come together at harvest time and work together on each other’s farms, to ensure that the harvest was saved and that all families were sorted for the Winter months ahead. 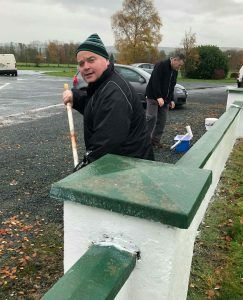 The meitheal was restored recently in Castlemitchell Churchtown, when local painter and decorator, Kevin Wright, volunteered his services free of charge to paint the exterior of our Castlemitchell Community Hall. The paint was supplied by the Churchtown Castlemitchell Community Development Association (CCCDA) and locals turned up at the hall early Saturday morning to help with the work. A good meitheal was traditionally followed fadó fadó by what was called a Cooring. This was the social element of the meitheal which occurred when the work was done and the local families gathered for food and drink, song and dance. The Castlemitchell meitheal, kept the cooring tradition somewhat on Saturday last, when Mary Delaney and Phyllis Fennin arrived with breakfast for the volunteers. All in all, a fantastic morning was had by all, where community spirit and participation was proven to be alive and well and our much cherished community hall was given a fantastic make over. The Castlemitchell Community Hall is available to rent to small groups. It is used for our CCCDA meetings, the Castlemitchell Karate Club, Castlemitchell Bowls Club etc. Churchtown playschool uses it each year for their Christmas play and for their graduation ceremonies and each December, the CCCDA holds its Annual Goose Club raffle in the Hall. This year, the Goose Club will take place on Sunday 9 December, commencing at 2.30pm and it really well worth a visit.